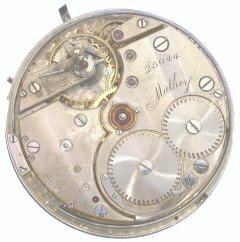 The antique Swiss pocket watch on this page was made by Mathey, circa 1895, later known as Mathey Tissot. Tissot is now owned by Omega. 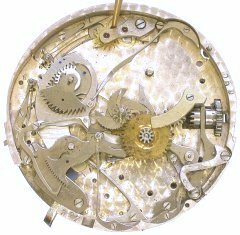 The minute repeater is, in my opinion, the ultimate complication. Working on repeaters should be left only to experienced professionals. This page only provides an introduction. For more information, I recommend Donald De Carle's book "Complicated Watches and their repair." 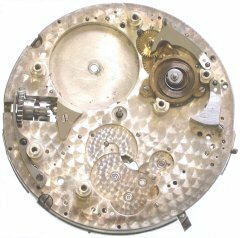 The purpose of the repeater was to enable its owner to know the time in the dark by moving a lever on the side of the case and releasing it. 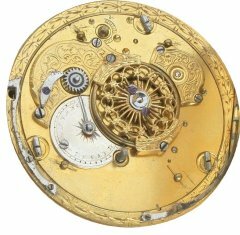 The repeater would then count the hours, striking on a wire gong inside the watch, followed by a count of the quarter hours and then a count of the minutes after the last quarter. For example, 2:52 would result in two strikes, then three strikes, then seven strikes. There are two parts to the hour rack, which are interdependent. As the parts rotate, the hour rack teeth lift and release the hour hammer pallet to count to number of hours. The hour snail is mounted on a star wheel, though this is difficult to see. 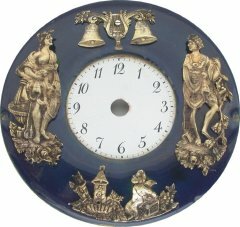 After a brief pause, the quarter rack teeth lift and release the minute hammer pallet to count the number of quarters. Finally, a hook on the quarter rack engages the minute rack, which determines the number of minutes to be counted. 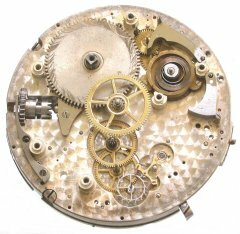 Another rack, referred to in the photo as the secondary minute rack, mounted onto the repeater's mainspring arbor, rotates, lifting and releasing the minute hammer pallet to count the number of minutes. The next photo shows the repeater parts after striking, in the resting position. This happens when the minute rack reaches a detent pin next to it. As a safety precaution, in case the hook fails to engage the minute rack, there is a second detent pin to stop the hook. Here are the parts under the bridge plates. 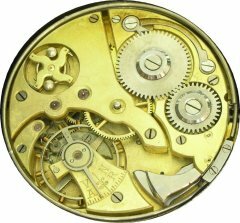 The repeater has a separate gear train and mainspring, independent of the time train. The two hammers that strike the gong are visible here. The pallet fork is made of brass, which is unusual. Below is the pillar plate after removing the time train. 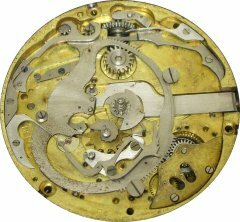 Here are two photos of a Swiss Quarter-Repeater pocket watch, ca. 1910. It strikes the hours, followed by a bim-bam for each quarter. 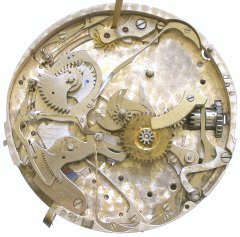 This watch has two hammers and two chime rods, an unusual timepiece that is fascinating to watch in action. 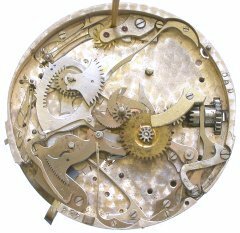 I removed the hour and minute wheels to make the repeater parts underneath visible. Below are photos of another repeater, probably from around 1760. 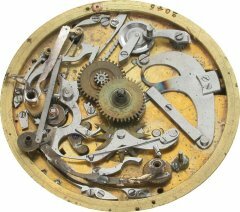 Watches of this vintage were made almost entirely by hand: gears were made on hand-operated lathes, and all parts were fitted and polished by hand. This exceptional work of art should be in a museum.